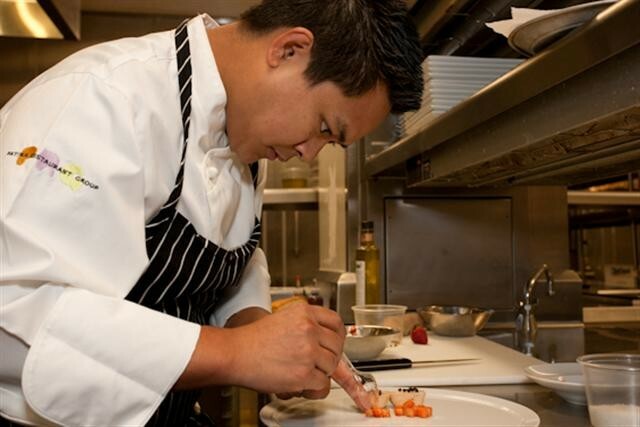 Chef Ross Pangilinan Departing Leatherby's Cafe Rouge For . . . .
Less than a month ago, we predicted there would be a shift in Downtown Santa Ana's culinary scene. Movement continues this week, as one of the most underrated chefs in Orange County informed us that he would be leaving his post at Leatherby's. We know that MIX MIX is a reference to halo-halo, the Filipino dessert. However, that's not to mean that this is a Filipino restaurant (see quote above). We imagine the kitchen's creative influences will come from many sources, including his sous chef Donald Harris. The two worked together at Leatherby's before Harris helmed the kitchen last year at Tangata. If all goes as planned, they will be up and running on the corner of 3rd and Main later this year. Back in December of 2010, Edwin interviewed Ross for our On the Line series. When asked what he thought he would see himself doing in five and ten years, Ross responded, “In five years I will still be cooking and maybe have kids. In ten years, either have my own restaurant or restaurants and be in a great chef position.” Looks like you're on your way, chef! On a related note, we ran into Bruce Marsh at Blinking Owl Distillery last weekend. Bruce mentioned that Saturday was the last night for his Black Box (formerly Little Sparrow) eatery. The new tenants are ready to MIX things up. What does this mean for the future of Hopper and Burr's daytime coffee destination? We'll learn soon enough.